Believe it or not, it’s here. Although you may have missed it, I announced it at the top of the year. 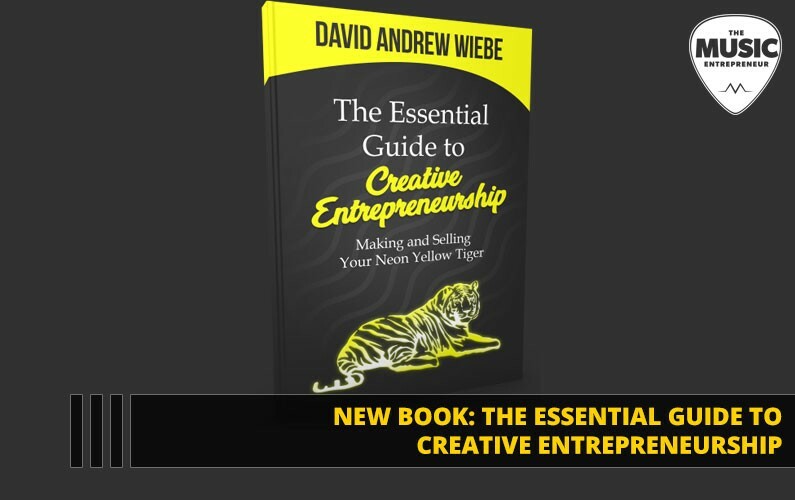 My new book, The Essential Guide to Creative Entrepreneurship: Making and Selling Your Neon Yellow Tiger. There is a bit of a backstory behind the creation of this book, but that’s something I’ll cover on another occasion. What I’d like to share with you right now is that this book is the perfect companion to The Essential Guide to Music Entrepreneurship. Where the music entrepreneur guide was more about mindset, the creative entrepreneur guide is more tactical. This isn’t to say there isn’t some overlap, but I think you’ll get a better idea of how to set up and run your business if you have a read through this one. So, I’d like to invite you to check out the book at musicentrepreneurhq.com/creative. I don’t have an info page set up for it just yet, so that link will take you directly to Amazon, just so you are aware. With that, I’d like to take a moment to read the introduction of the book for you. For many, traditional job roles simply aren’t cutting it. The Balance indicates that in October 2018, U.S. consumer debt rose 7.7% to $3.964 trillion. Credit card debt, auto loans and school loans account for most of this debt. The Balance also points out that, while home mortgages are a major loan category, they don’t classify it as debt–mortgages are considered a personal investment. I don’t agree with that assessment, but that’s beside the point. Then, there are those whose side hustles have become their full-time hustle, in the form of a small, independent business. Whether it’s selling hand-crafted jewelry on Etsy, publishing unique music videos to YouTube and monetizing them through Patreon, or taking on freelance graphic design work through a freelancing site like Upwork, there simply isn’t a shortage of opportunities. As someone who’s been working entirely from home since summer 2016, I consider myself a proponent of the gig economy. Up until that point, I was dividing my time between ghostwriting and content work, audiovisual tech work at the University, helping organize and host unique creative events, teaching guitar and playing live gigs as a musician. In case you’re wondering whether I was “making it” during those years leading up to 2016, I was paying down my debt at a ferocious rate and even stockpiling my savings. But it was madness. As my ghostwriting and content work started taking off, I decided to leave “organized chaos” behind so I could focus on what was becoming a more lucrative opportunity for me–ghostwriting and content work. That also freed me up to put more time and effort into creative communities, gigging and building my small, independent business–The Music Entrepreneur HQ. As I look towards the future and what I’m planning to accomplish, I can see that the possibilities are nearly limitless. My small business doesn’t need to stay small forever. My earning potential isn’t capped. I can make my own hours and work when I’m at my personal best. And, though outreach is still a crucial part of what I do, people often come to me wanting to work with me, whether it’s independent musicians, music business owners or other creatives. And, that’s the same opportunity that’s staring back at you. This isn’t to suggest that entrepreneurship–or freelancing, for that matter–is easy. But it is simple. It’s all about finding a need and filling it. It’s about serving a hungry audience and presenting a solution that’s right for them. How can I serve an audience with my art? Do I need to sell out to make it? Am I required to adapt my art so that it appeals to a larger audience? And, the answer is “it depends”. It depends on what you’re hoping to achieve. There’s nothing wrong with creating art for the sake of creating art. If it fulfills you and you find joy in the process, I think that’s worth more than any price tag you could put on it. And, if you’re lucky, simply engaging in what you love can attract an audience. As a musician, I’ve often created music that I wanted to create as opposed to music that fits a certain demographic’s interests. But I’m also under no delusion that this music will reach a huge audience and result in large sums of revenue. Music represents an important outlet for my creative self-expression, and to that end it will always serve my needs. Beyond that, it’s anybody’s guess. But when it comes to serving my audience–namely creative entrepreneurs–that’s a different matter entirely. I am focused on creating content that benefits them and helps them reach their goals, whatever they may be. Adding value to others can take many forms. And, sometimes the things you put effort into don’t always bear fruit. But I find the process fulfilling. Though I have certain business goals I want to reach, I’m more focused on the journey than on the destination. If I’m not enjoying the process, perhaps I’m not engaged in the right activity. So, creative entrepreneurship may not be for everybody. But the good news is that you can pursue it at whatever level is right for you. I know there are plenty of experts selling the idea of hustle out there. And, they talk endlessly about the fact that if you’re not struggling, you’re not getting anywhere. To succeed, you need to be pulling 14- to 16-hour days, butting your head against the wall, and if you’re not, you’re probably not going anywhere. But I know for a fact that you don’t need that type of work ethic to earn an extra $500 to $1,000 per month. So, if that’s your goal, you’re probably not listening to the right people. Go as far as you can, and then you’ll see further. And, for you, going as far as you can might be starting a blog and sharing your poems on a weekly basis. There’s nothing wrong with that. Maybe, in a few months, or in a few years, you’ll want more. At that point, you can choose whether you’re ready to commit to more. The greater the desire, the more work you’ll need to put in. But you don’t need to start off with 16-hour work days, especially if your goals are humble. In the chapters that follow, you will learn about various aspects of creative entrepreneurship, from marketing your art to building a team and a great deal more. The ideas and examples presented should help you navigate the road ahead, whatever that may look like. This book is intended as an overview to creative entrepreneurship. But there are references to plenty of great tools and resources you can access throughout. If you need additional help, I suggest that you refer to these. And, if you have any questions, don’t hesitate to reach out to me personally. I wish you success on the journey ahead. Originally published at www.musicentrepreneurhq.com on January 25, 2019.